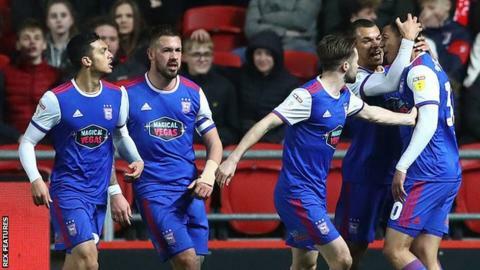 Bristol City's Championship play-off bid was dealt a further blow as they were held to a lacklustre draw at home by the division's bottom side Ipswich Town. The Robins, well short of their best throughout at a flat Ashton Gate, moved back up to sixth with the point but are now winless in five league matches. Having ridden their luck during a shaky first 20 minutes, Adam Webster's glancing header against his former club put the home side in front. But the Tractor Boys, who remain 11 points adrift of 21st-placed Millwall, deservedly levelled after the break when Lloyd Kelly diverted Andre Dozzell's fizzing cross into his own net. Lee Johnson's side failed to create a really meaningful opportunity after the equaliser, with Ipswich looking the more likely to go on and grab a winning goal that would have capped a spirited away performance. Town have won only three times this season - and just once on their travels - but more than matched their promotion-chasing hosts. An error by debutant goalkeeper Stefan Marinovic inside the first 45 seconds seemed to set the tone for Bristol City's nervy display, with Kelly having to produce a brilliant recovering tackle to deny a certain goal after he had been charged down by Kayden Jackson. The New Zealand international endured a mixed evening, producing an excellent one-handed save to tip Gwion Edwards' shot around the post but always looking uncomfortable with the ball at his feet. At the other end, Andreas Weimann struck the outside of the post and Famara Diedhiou acrobatically volleyed over the crossbar, but City were otherwise insipid in attack. They have now mustered just three goals in their past four games and have failed to score more than twice in a match since beating Ipswich 3-2 in the reverse fixture on 28 November. "I'm pleased with a point because we were nowhere near our best and that could be the most important point of the season. "I know it wasn't good enough and I'm not trying to hide that but I've got a feeling that's not that negative because we could have lost that game. "There's a nervousness at home that we don't seem to play with away but I suppose that comes down to enjoying it. "If we had a ticket at the start of the year saying at this point of the year we'd be sixth or seventh we'd have taken that and be excited by the fact that this could be our year." "I don't think we deserved to draw, I think we deserved to win. "They scored against the run of play and they've spent a few quid - we were dominant on the ball. "Second half was all us - they never really threatened and I thought we were the only team who was going to go and win it." Match ends, Bristol City 1, Ipswich Town 1. Second Half ends, Bristol City 1, Ipswich Town 1. Attempt missed. Marlon Pack (Bristol City) right footed shot from outside the box is high and wide to the right. Assisted by Kasey Palmer. Attempt blocked. Marlon Pack (Bristol City) right footed shot from the centre of the box is blocked. Assisted by Kasey Palmer. Corner, Ipswich Town. Conceded by Lloyd Kelly. Attempt missed. Josh Brownhill (Bristol City) left footed shot from the left side of the box is close, but misses to the left. Substitution, Ipswich Town. Teddy Bishop replaces Andre Dozzell. Idris El Mizouni (Ipswich Town) is shown the yellow card for a bad foul. Attempt blocked. Kasey Palmer (Bristol City) right footed shot from the centre of the box is blocked. Offside, Ipswich Town. Myles Kenlock tries a through ball, but Kayden Jackson is caught offside. Offside, Ipswich Town. Andre Dozzell tries a through ball, but Idris El Mizouni is caught offside. Corner, Bristol City. Conceded by Myles Kenlock. Substitution, Ipswich Town. Idris El Mizouni replaces Alan Judge. Substitution, Ipswich Town. Cole Skuse replaces Jon Nolan. Substitution, Bristol City. Kasey Palmer replaces Jamie Paterson. Substitution, Bristol City. Callum O'Dowda replaces Andreas Weimann. Own Goal by Lloyd Kelly, Bristol City. Bristol City 1, Ipswich Town 1. Corner, Ipswich Town. Conceded by Stefan Marinovic. Attempt saved. Gwion Edwards (Ipswich Town) right footed shot from outside the box is saved in the bottom right corner. Attempt missed. Jamie Paterson (Bristol City) header from the centre of the box misses to the right. Assisted by Niclas Eliasson with a cross. Offside, Ipswich Town. Trevoh Chalobah tries a through ball, but Kayden Jackson is caught offside.